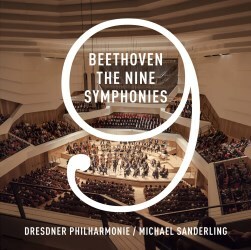 The Dresdner Philharmonie under its principal conductor Michael Sanderling, has been releasing on Sony Classical, an ambitious ongoing series of recordings of the complete symphonies of Beethoven and Shostakovich, pairing together a symphony from each composer on the same album. Now that the Dresdner Philharmonie has recorded all the Beethoven symphonies over three seasons, the label released here the complete nine symphonies as a stand-alone box set. I already reviewed recordings of five of these symphonies in this series of Beethoven coupled with Shostakovich symphonies. However, the recordings of Nos. 2, 4, 7 and 8 are being released for the first time. There is a plan to release the Shostakovich cycle as a box set next spring. The Dresdner Philharmonie has a long and esteemed tradition of playing Beethoven. Throughout the set Sanderling endeavours to follow the instructions on the composer’s original scores but without being unduly prescriptive. He uses contemporary insights of historically informed performance practice yet remains mindful not to erase the orchestra’s characteristic identity. Only a few months ago at the Kulturpalast, in Dresden, I reported on Sanderling conducting the Dresdner Philharmonie in a stunning performance of the Fifth Symphony thus attesting to the excellence of this partnership. The Dresdner Philharmonie get off to a flying start with the often-overlooked First Symphony, the shortest in length of the cycle. Completed in 1800 the score bears a dedication to Baron Gottfried van Swieten, Beethoven’s early patron. The First was premièred in 1800 at the Hofburgtheater, in Vienna and it is thought that the composer himself may have conducted it. Immediately noticeable is the unstinting freshness and liveliness, with an uncommonly achieved unity from the Dresdner players and Sanderling’s judicious tempo selection. In the brisk and spirited opening Allegro, Sanderling establishes an exhilarating mood contrasting with the ingrained warm, rustic character of the graciously played Andante. Infectious is the level of unbridled joy produced in the uplifting Menuetto. In the Finale, the serious mood of the short opening Adagio is confidently swept away by the vigour and buoyancy of the upbeat Allegro. Mainly composed in 1802, during Beethoven’s stay at Heiligenstadt, the Second Symphony is dedicated to benefactor Prince Karl Alois Lichnowsky. Beethoven premièred the Second the following year at the Theater an der Wien. A product of the time of Beethoven’s harrowing emotional turmoil, as demonstrated by the so-called Heiligenstadt Testament, Sanderling permeates the determined opening movement, marked Adagio molto – Allegro con brio, with a primarily dark, serious mood. He communicates then such agreeable repose in the Cantabile, Larghetto and, by contrast, the sudden fiery burst of energy in the Scherzo is mightily impressive. The Finale is joyous and uplifting, repeatedly swirling round and round, and concludes blithely on a festive note. A frequently heard work in the concert hall, it is well known that Beethoven originally dedicated his Third Symphony to Napoleon Bonaparte before tearing up the relevant page and replacing it with the title ‘Eroica’. Completed in 1804 the score was written in the midst of the famous ‘Heiligenstädter Testament’ a letter that Beethoven wrote to his brothers Carl and Johann in 1802. Having contemplated suicide, the ‘Testament’ reflects the composer’s deep depressive state provoked by the loss of his hearing and maybe exacerbated by a failed love affair. Beethoven introduced the Third publicly in 1805 at Vienna. In this Lukaskirche, Dresden recording is evident Sanderling fully appreciates this progressive score is music of extensive concentration, intensity and, as the designation might suggest, heroic power. Naturally flowing and stimulating with an undertow of mystery in the Allegro, the performance of the Dresdner players conveys a sense of defiance in the face of adversity. The conclusion is especially thrilling. Underpinned by the rich low strings, the angst ridden and world-weary tread given to the renowned Marche funèbre is both resolute and respectful. A character of unbridled joy imbues the Scherzo with some arresting playing from the horns. In the Finale, with striking immediacy, it feels as if the spirit of life has broken free and Sanderling’s swirling, dramatic power makes a compelling impact. Written in the summer of 1806 the Fourth Symphony is dedicated to Count Franz von Oppersdorff, a Silesian nobleman who commissioned the work. Beethoven actually stopped working on the Fifth to compose the Fourth. It was only in the following year that Beethoven conducted the Fourth before the public at a Liebhaber-Concert in the University of Vienna. Opening with an Adagio, the dark foreboding mood of the first movement easily evokes a dark prison scene from an opera, perhaps foreshadowing his own opera ‘Fidelio’. This is followed by an Allegro Vivace section, radiating an uplifting celebratory feel. Delightfully lyrical, the Adagio movement flourishes with sensitive playing from the Dresdners, which is all disarming calm and contentment. The third movement Allegro Vivace, which combines elements of the scherzo and minuet, is assuredly played with Sanderling making short work of the complex challenges of rhythm and tempi control. Marked Allegro ma non troppo, the dazzling finale under Sanderling’s baton feels robustly exhilarating. After a gestation period of several years, Beethoven completed his Fifth Symphony in 1808. It became one of the landmark works of the genre. Dedications to both Prince Lobkowitz and Count Rasumovsky appear on the printed score. Beethoven himself introduced the symphony the same year at the Theater an der Wien, in Vienna. An enduringly popular work, which the orchestra and conductor will have performed countless times, there is never any sense of routine, and they clearly lavish great care and attention on this Beethoven score. Overall, in this firmly focused performance, the playing of the Dresdner Philharmonie sounds unfailingly stylish and eminently fresh, generating a satisfying level of drive and energy. In the bold opening movement, marked Allegro con brio, Sanderling creates a resolute, rather serious tone. One of my favourite movements in all Beethoven’s symphonies is the Andante con moto where Sanderling fashions a dedicated sense of engagement, with an inner glow redolent of a magnificent Alpine scene in the Austrian Tyrol. Hard to match is the spine-tingling intensity that Karajan and his Berliner Philharmoniker brought to the Andante con moto in their 1962 account at the Jesus-Christus-Kirche, in Berlin, on Deutsche Grammophon. Considerable optimism is conveyed in the third movement’s Scherzo with Sanderling demonstrating such marked contrasts of dynamics. The Allegro: Finale is as exhilarating as I have heard, providing a satisfying sense of resolution. Compared to the approach of ‘big-band’ Beethoven of immense tonal power, often encountered in many of the older recordings of the Fifth (for example Wilhelm Furtwängler with the Berliner Philharmoniker in 1943 and 1947), Sanderling adopts a less weighty but stylish performance with a contemporary feel that has real gravitas. Beethoven rarely journeyed into programme music but with his Sixth Symphony ‘Pastoral’ he created one of the greatest examples ever. Also completed in 1808 this score of Beethoven’s “expressions of feelings”, suggesting an eventful and picturesque journey through rustic scenes, is constructed in five movements. It is also dedicated to Prince Lobkowitz and Count Rasumovsky and is thought that Beethoven conducted its première, on that same year, once again at Theater an der Wien. In 1991, on a BBC Radio 4 programme ‘Desert Island Discs’, Sue Lawley’s guest was conductor Klaus Tennstedt. He selected Beethoven’s Symphony Sixth for his first work, explaining that although the score was not technically difficult for the players it was extremely challenging for an orchestra to bring it off well. Sanderling and his Dresden players provide a stunningly beautiful account of the Sixth in a captivating reading that vividly portrays this life-enhancing score. Gloriously impressive is the opening movement, an ‘Awakening of cheerful feelings upon arrival in the country’, with playing that easily evokes an appealing Viennese countryside scene. Engagingly performed under Sanderling ‘The scene by the brook’ develops an evocative, near Arcadian setting. Wholly satisfying is the orchestra’s playing of the Scherzo, a ‘Merry gathering of country folk’, with such delightfully sprung rhythms recalling rustic dancing and merriment suggestive of a scene from say a Pieter Bruegel painting. Sanderling ensures that the penultimate movement Allegro, titled ‘Thunder and Storm’, has impact and a steady potency. Impressive is the uplifting Finale ‘Shepherd’s song, a splendidly paced Allegretto, displaying cheerful and thankful feelings after the storm. Noticeable throughout is Sanderling’s sense of controlled engagement, drawing from his dedicated players a most beautifully polished, well-rounded performance, in a reading that avoids extremes of expression and dynamics. Sanderling’s reading evokes looking at nature through a window but rarely has the image been so crystal clear. Both the Seventh and Eighth Symphonies were completed in 1812 yet they differ widely. Dedicated to Vienna arts patron Count Moritz von Fries, the Seventh Symphony enjoyed great success at its 1813 première at the Vienna University. It was Wagner who famously described the symphony as the “apotheosis of the dance”. In Sanderling’s confident hands, the passionate music of the extended opening Poco sostenuto - Vivace, feels like the overture to an unwritten opera and is irresistibly played. Striking is the austere beauty created in the much admired Allegretto, possibly a homage to those soldiers who had recently died fighting the French invaders. The level of vivacity and joy that Sanderling achieves in the Scherzo is uplifting, and the inspiring Finale is stunningly played with an infectious exuberance. However, I have yet to hear a performance of the Finale that equals the level of intensity that Wilhelm Furtwängler and the Berliner Philharmoniker gave to their live recording from October/November 1943 at the (Alte) Philharmonie, in Berlin. Beethoven affectionately described his Eighth Symphony as “My little Symphony in F”. There is no dedication given to the Eighth Symphony, a work overshadowed by the immense dimensions of the Seventh and Ninth. Beethoven introduced the Eighth to the public in 1814 at the Redoutensaal, in Vienna. Without forfeiting precision there is a strong sense of spontaneity to Sanderling’s exciting interpretation. Compellingly played, the opening movement Allegro vivace e con brio feels proud and resolute. Gloriously melodic in the Allegretto scherzando, Sanderling ensures wonderfully sprung rhythms and an inspiring expression that evokes the scene of a toy shop. His attractive and stately Tempo di menuetto is agreeably engaging with keen bucolic feel. The Dresdner players rise to the challenges of the festive and good-humoured Finale: Allegro vivace. This movement's seemingly unlimited and sudden variations of rhythm and tempi are matched by a capacious imagination. Dedicated to King Friedrich Wilhelm III of Prussia, Beethoven’s colossal Ninth Symphony is one of the most familiar works in the entire classical music repertoire. Composed in 1823-24 it is unusual for its massive choral finale, a setting taken from Friedrich Schiller’s poem An die Freude (Ode to Joy). It’s astonishing to think that by the time of its première, in 1824, at the Kärntnertortheater, in Vienna, Beethoven was profoundly deaf. In the opening movement Sanderling expertly controls the tightening of tension, eschewing the extreme feelings of intense torment and fury one sometimes encounters. In the great Scherzo this reading is determined and intense, conveying a sense of emotional uncertainty. Under Sanderling a sense of spirituality pervades the beautiful slow movement, effortlessly drawing in the listener. This is remarkably fine playing with the radiant woodwind choir, brass and refined strings all serving to underscore the atmosphere of melancholy, which easily evokes the pain of parting from a loved one. The crowning glory is the closing movement with its famous choral setting of ‘Ode to Joy’ that can seem like an independent work. Notable here are Sanderling’s superbly controlled climaxes while in the Presto section the resonant double basses establish a rock-solid foundation, conveying an impression of dark menace. In the choral section, the quartet of soloists is nicely contrasted. Markedly, the steadfast voice of bass Torben Jürgens has an attractive, pleasing clarity; tenor Bernhard Berchtold is bright and taut; Vera-Lotte Böcker displays her glorious soprano tone and alto Kristina Stanek is agreeably expressive. Tightly drilled under Michael Gläser, the exceptional MDR Rundfunkchor perform with splendid unity and focus. As opposed to those accounts in the record catalogue imbued with blood and thunder, Sanderling takes a different route. Although potent and focused he doesn’t overload the weight of the playing, astutely holding back the frenzy thus avoiding the chance of uncomfortable cacophony. Sanderling presides over a compelling performance that feels dignified with considerable humanity. At the conclusion of the score, the sense of exultation is complete. Characteristically stylish and entirely compelling throughout, the Dresdner Philharmonie under Michael Sanderling demonstrates its interpretative prowess in these inspiring Beethoven symphonies. Powerfully convincing, Sanderling’s responsive performances feel fresh and buoyantly rhythmic. There is plenty of impetus when required and I find the choice of tempi eminently satisfying. Notable throughout is the striking woodwind playing and the magnificent sound of the brass section, conspicuous for its unswervingly agreeable intonation. Gratifying is the unity and range of the Dresden string sound. The high strings create a lovely bloom and the markedly rich tone and intonation of the cellos and basses is vital for ensuring a rocksteady foundation. Five symphonies in this Dresdner Philharmonie cycle are recorded under studio conditions at the Lukaskirche with its renowned acoustic. The remaining four symphonies are recorded at the orchestra’s new home, the recently refurbished Kulturpalast and, certainly for the Ninth, the sound engineers use a mix of part-concert situations and part-studio conditions. There is a pleasing consistency to the recordings with impressive clarity – for example, it’s rare to hear such detail in the winds, making the presence realistic with satisfying balance. In the booklet, Albert Breier wrote a helpful and most readable essay. For the Ninth Symphony, the sung German text is provided with an English translation alongside it. With regard to alternative recordings, as this is a complete Beethoven cycle from Sanderling, I am focusing on other complete sets rather than single recordings of particular symphonies. There is such an outstanding choice available in the record catalogue that, in this crowded market, it can be difficult to settle on one specific set of symphonies. Actually, there are a few conductors who have recorded more than one cycle with Karajan having conducted four. Of the long established complete sets, those that I most admire are from the Berliner Philharmoniker/Claudio Abbado/Deutsche Grammophon; Berliner Philharmoniker/Herbert von Karajan/Deutsche Grammophon (1961/62); Wiener Philharmoniker/Simon Rattle/EMI; Berliner Philharmoniker/André Cluytens/EMI and Wiener Philharmoniker/Karl Böhm/Deutsche Grammophon. Concerning newer sets, my first choice is the Berliner Philharmoniker under Sir Simon Rattle on Berliner Philharmoniker Recordings. With such outstanding performances my principal impressions are of the elevated level of musical intelligence and structural coherence of the interpretations that Rattle obtains from his Berlin players. Worthy of attention too is the ongoing cycle from the Wiener Symphoniker under Philippe Jordan, which is going from strength to strength on the orchestra’s own label. Particularly impressive is the latest release in Jordan’s cycle of Symphonies Two and Seven. This inspiring Dresden cycle from Michael Sanderling can stand proudly alongside the above recordings and unless you need big-band Beethoven, this is one of the finest of the newer sets. In what feels like a labour of love, the Dresdner Philharmonie provide characteristically stylish and penetrating performances that are entirely compelling.